Say hello to the newest addition to my phonecase collection, Daisy II! I briefly Instagrammed and included a photo of her in my Week in Photos over the weekend, but thought I’d pop a quick post up about the case to answer the questions that came in thick and fast. My phone (Sony Ericsson Xperia Ray, which I’d highly recommend for anti-iPhoners, for those wondering) is notoriously hard to buy cases for. I don’t think it’s any surprise that I adore a good old personalised phonecase, I guess it comes with the stereotypical Chinese girl image, but I’ve always liked to adorn my phone with something a little different! 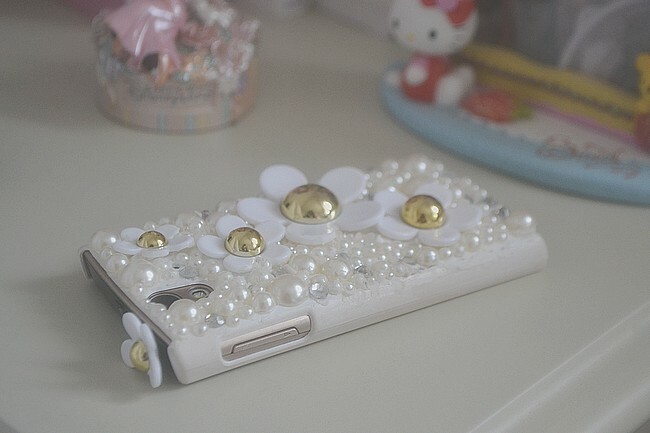 I ended up hand-making this phonecase: the outer, hard shell was a cheapie from eBay – any plain one will do, although I chose white to match the pearl dekoden pieces – and I found a reasonably priced set of Daisy by Marc Jacobs inspired supplies with a little bit of searching on Etsy. The seller I used was Happybeadsupply, who I’d thoroughly recommend, and I just sat down for half an hour with my sister and a tube of extra-strength adhesive, and placed the cabochons wherever I liked them! I love how my case turned out and it’s very ‘me’ as well as rather ‘Daisybutter‘ too!